Great Bay, St. Martin - In less than one month in 2011, it appears that an unprecedented number of literary prizes were awarded to major Caribbean writers in their own region. On May 6, the distinguished author George Lamming was awarded the Caribbean Hibiscus Prize in Cuba, said his HNP publisher here on Monday, May 9. In addition to its regional significance, UNEAC president Miguel Barnet said the prize aims at spreading more awareness about Cuban culture and the institution’s work. During the award ceremony, Cuban poet Nancy Morejon pointed out that the Hibiscus Prize is named after a flower common to Caribbean nations, and that “Lamming was selected to receive this first edition of the prize because when you read his works you can understand Nature and the regional spirit better,” reported RCA radio (FM 105.3). Culture Minister Abel Prieto attended the ceremony, held at the UNEAC. Long hailed as one of the “adamic fathers” of Caribbean Literature, Lamming’s newest book of essays, Sovereignty of the Imagination, was published in St. Martin by HNP, said Sekou. Sovereignty and Lamming’s Western Education & The Caribbean Intellectual, also from HNP, are available at Van Dorp and other bookstores and libraries in the region, www.amazon.com and other online stores. 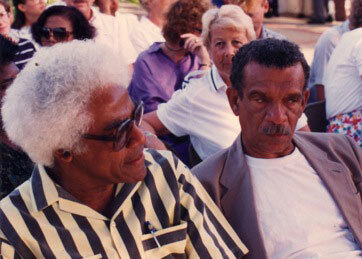 On April 29, it was the Nobel Laureate Derek Walcott who was honored. The acclaimed St. Lucian author, whose mother’s family hails from St. Martin, received the first edition of the OCM Bocas Prize in Trinidad for White Egrets, his latest poetry collection. The volume has already won the prestigious TS Eliot Prize. In a year with what appears to be an unprecedented appearance of literary prizes with regional projection, Guadeloupe took center stage from April 6 - 9, with its 2nd International Congress of Caribbean Writers.